The baby products that are most important for the first year include clothes, baby gear, diapers, sleeping crib, breastfeeding as well as bottle-feeding, bathing, health, safety, and toys. When it comes to clothing the new baby, it is best to purchase by age, although the sizes hugely differ between different brands. Clothes should be light, and those indicating size via weight and height might be the best option. Some babies never wear the 0 to 6 months clothes and fit straight into 3 to 6-month baby grows so parents may never need new-born sizes, which is why it is safest to purchase 3 to 6 months from the start. Best for everyday wear is clothes that allow easy nappy changes and allow the baby to sleep in comfort. Roomy, soft, durable clothing allows baby to move easy and rest without discomfort. By investing in well-made clothing items, more wear guaranteed since these will last best through frequent washings. The benefit of organic clothing is that these mostly hand-made, comes without the use of any potentially harmful chemicals or harsh dyes, although it is considerably more expensive. One of the most important ways to ensure baby’s comfort is by using a baby-friendly detergent, which will also prevent any skin irritation. Organic brands first took over the beauty industry and are now also available to new mothers who want the best for their newborns. A natural start is best, and therefore several organic products take care of sensitive and delicate skins. The product most recommended by mothers around the world for the nappy area is Burt’s Bee, an all in one product that offers petroleum-free as well as non-irritating, multipurpose ointment use. Another great product available is Weleda created in cooperation with midwives, called White Mallow this baby range of products offers nourishing sweet almond and organic oils of coconut combined with organic beeswax perfect for dry, hypersensitive or atopic baby skin. Your baby’s skin is sensitive to sunlight and needs the best protection available. The Green People created a high factor sun lotion that is natural and SPF30 called the Green People’s Organic Children Sun Lotion, which is a must for walking, or holiday. If baby sleeps well, so does you and for a restful sleep, look no further than Aleva Naturals Sleep Easy Calming Lotion, enriched via lavender oils to assist in baby’s sleep routine. 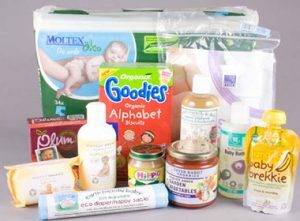 Earth Friendly Baby products offer 100% natural shea oil to smooth and hydrate baby’s sensitive skin. And then the most essential are baby wipes, and with Storsak Organics, baby’s skin is completely protected, and the wipes are 100% biodegradable to also protect the planet.